Comics and archaeology should be natural cousins. After all, most ancient languages – Egyptian hieroglyphics being an obvious example – exploit the same image/text synergies as comics. 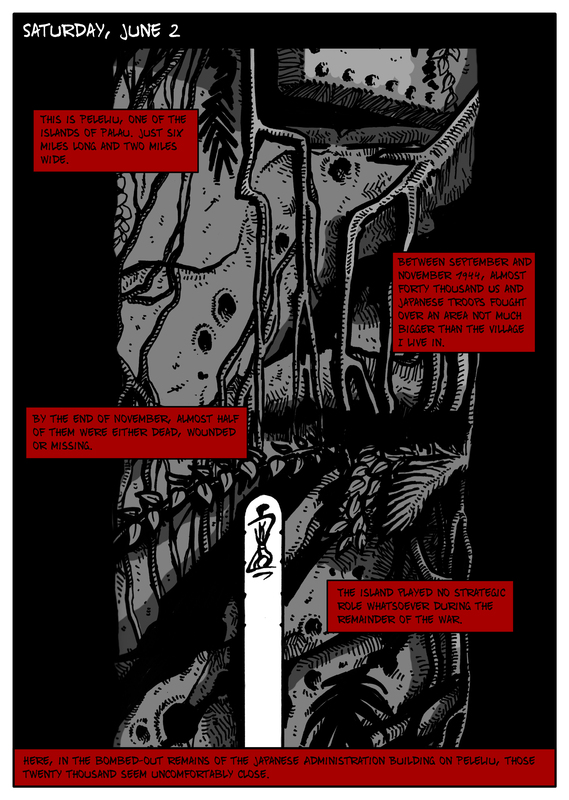 What is perhaps surprising is how limited a role comics have so far played in either formal or informal archaeological discourse – particularly given the fact that archaeology is a highly visual science, and the presentation of archaeology depends to a great extent on visualising specialist concepts and practices. Watch any episode of Time Team, and it becomes clear why it works as television: the presenters’ language is about showing, not telling. “Look over here,” Tony Robinson will call to the film crew, “Have a look at this,” Phil Harding will say, scraping away with his trowel, “This is the remains of a ditch,” Mick Aston will explain, “Running all the way along there, over the field to the edge of the hill.” As arms wave and fingers point, patches of dark and light soil become castles, forts and houses in the mind’s eye. This is the language of visual explanation, and it is used just as much in professional discourse as public presentation. So where are all the archaeological comics? Archaeological comics do exist, and a quick survey demonstrates that even if their use has been limited, it has also been encouragingly diverse. Comics in archaeology tend to fall into three distinct categories: comics about archaeological subjects, comics about the archaeological process, and comics as archaeological publications. Asterix and Obelix is a leading example of comics in this first category, and the books still provide many children with their first introduction to the Roman world. Sneak a look at the bookshelves of most archaeologists working with Roman material and you’ll almost certainly find a copy of Asterix the Gaul lurking between the British Archaeology Reports and copies of the Journal of Archaeological Method and Theory. The enduring appeal of Asterix lies in its ability to bring together engaging, human stories with an Iron Age European setting; not an obvious mix. Ben Haggarty and Adam Brockbank’s Mezolith uses the same formula, bringing together archaeological evidence and interpretations of past societies with compelling storylines. Works like Le Soleil des Morts (Gallay & Huout), or Eric Shanower’s Age of Bronze attempt to go one step further, using the medium to project specific interpretations about how the past looked and worked, and about how people interacted to create the world they lived in and the objects, myths and histories which have come down to the present. Asterix, Mezolith and Age of Bronze all share one feature in common: they are primarily the work of non-archaeological illustrators and writers, using archaeological themes and tropes to construct comic and graphic works. As such, they represent an outsider’s view of what archaeology says about the past, and are often highly imaginative and occasionally worryingly inaccurate. Nedir Çatalhöyük copyright John Swogger. Click image for larger version. The second category of archaeological comics – comics about the archaeological process – tend to be more overtly didactic. They work like other educational comics – exploiting the medium’s ability to speak to a different audience than text. 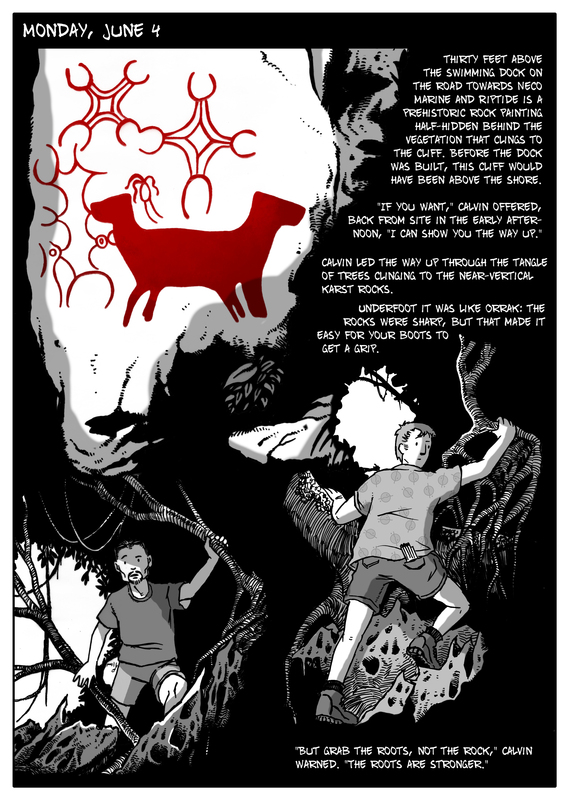 Bartley Collart’s Written in Bone: The Secret in the Cellar, is a good recent example from the Smithsonian Museum – a webcomic about the process of excavation and interpretation at a historical site in the US. 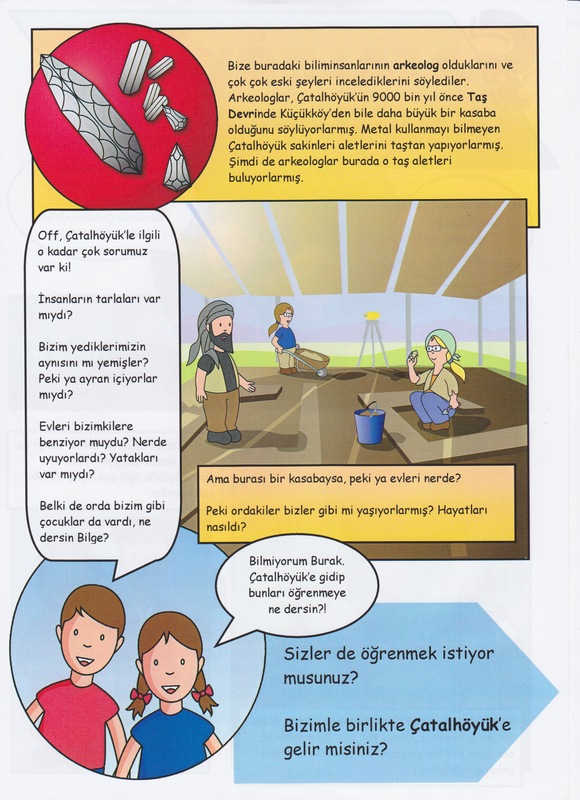 The object was to create educational material about archaeological work aimed at a younger audience. 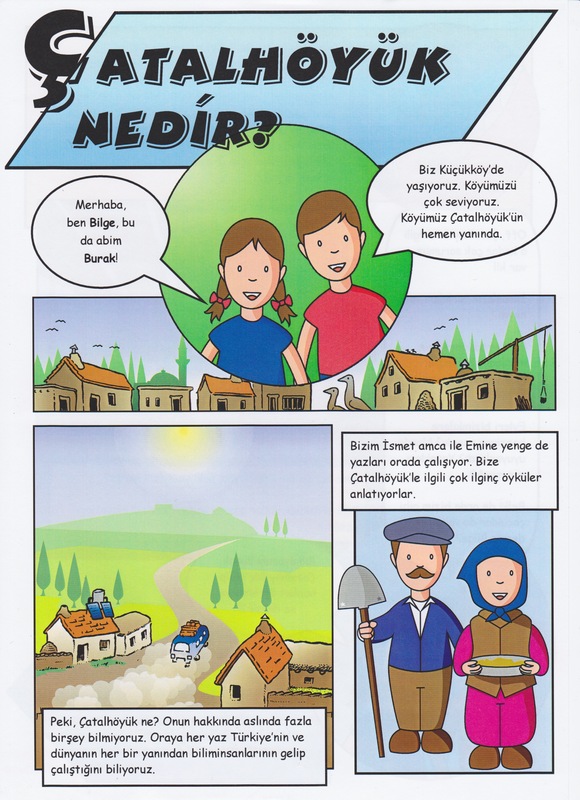 My own Nedir Çatalhöyük? (above) and ‘Archaeology in the Caribbean’ (below) are similar examples. 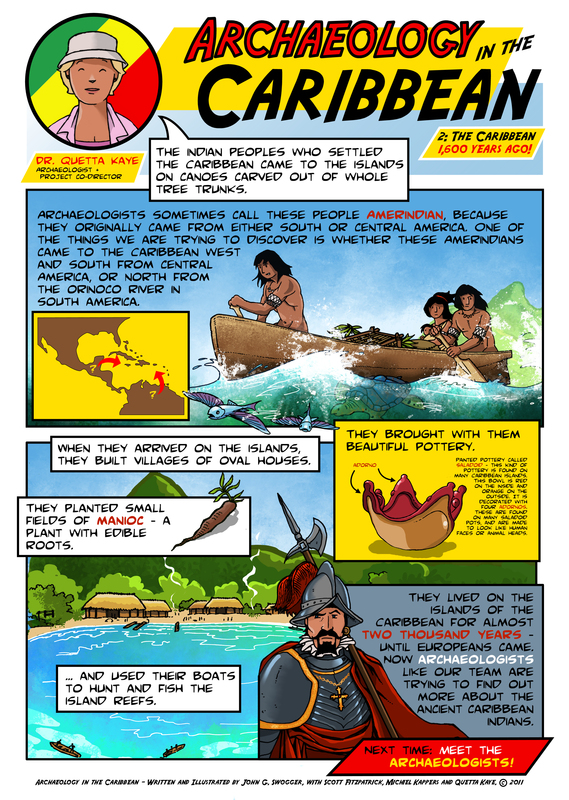 ‘Archaeology in the Caribbean’ is a twelve-part comic being published in newspapers in the Caribbean about the prehistoric archaeology of the islands and their potential importance as a cultural, educational and economic resource. The objective was to produce something which would be accessible to audiences young and old regardless of literacy skill level. Archaeology in the Caribbean copyright John Swogger. Click image for larger version. Although I am an archaeologist and an archaeological illustrator, Written in Bone and other comics about the archaeological process tend largely to be produced by professional artists, illustrators and graphic designers in consultation with archaeologists and museum professionals for a public, non-archaeological audience. Importantly, these are works that acknowledge that archaeology is as much about present science as a past society. However, they are still comics about archaeology and archaeologists. Rarest of all archaeological comics are those created by archaeologists, for archaeologists: comics as archaeological publications, focused on professional and academic topics. They may be rare, but a few do exist – such as Trent “T-Rex” de Boer’s Shovelbum, an archaeological comic ‘zine (published in collected form as Shovelbum: Comix of archaeological field life). Started in 1997, Shovelbum grew out of a “folk” tradition common to many archaeological digs (and possibly most workplaces) of turning workplace lore and daily experience into short, sometimes informative, often humorous cartoons. The collected comics are full of in-jokes and wry references to frustrations and rewards of archaeological work. As such, they are aimed at least partly at a knowing, archaeological, audience. One of the contributors to Shovelbum was Troy Lovata, who wrote his University of Texas Doctoral dissertation on canine domestication as a comic book: “44 pages of a dog discussing archaeology,” as Lovata describes it (Lovata, 2005:22). Lovata admits that he had to include a lengthy, traditional and text-based defence of his thesis, and that he wasn’t entirely sure that the thesis review board paid much attention to the comic – but it surely remains an extraordinary attempt to use comics in a non-comic academic context. These comics work because they acknowledge that regardless of whether it is understood as an academic discipline or a professional practice, archaeology is both a highly visual and a highly narrative science. In other words, whether in the lab, the field or the library, there is much about archaeology that depends of being able to see and show rather than simply tell. The forensic logic of archaeology builds a multi-layered argument out of disparate factual and interpretative visual elements. What the hybrid medium of comics offers archaeology is a partnering of image and text in the service of complex and visual narrative. An excellent example of how comics can help make clear the different interpretative, factual and visual strands within an archaeological narrative can be seen in Alex Maleev and Mariel Furlong’s ‘The Killing of the Iceman’, a short comic-format illustration produced for National Geographic. The same approach clearly informs the recent collaborative project by illustrator Nuka Gotfredsen, the SILA (the Arctic Research Centre at the Ethnographic Collections of the Greenland National Museum and Archives) and the Grønlands Skolebogsforlag. They are producing a four-volume comic-book story about the settling of Greenland in the Inuit newspaper Sermitsiaq. As with ‘Archaeology in the Caribbean’, both exploit this long-established historical link between comics and newspapers to ensure that the end result is relatively inexpensive to publish and widely accessible. Gotfredsen’s clear, visually accomplished artwork emphasises the potential of the comic format to communicate complex archaeological information to an audience largely unfamiliar with many of its basic concepts. Just like the music video, the comic is greater than the sum of its two component media, and this synergy creates narrative opportunities beyond the scope of either. Comics offers archaeology a medium tailor-made to its own communication requirements. Following the lead of DeBoer and Lovata, and building on my own experience of writing and illustrating ‘Archaeology in the Caribbean’, throughout June I am producing a comic-format archaeological field journal (below). The journal is documenting six weeks of excavation and illustration work on the Pacific island of Palau in Micronesia. Part travelogue, part diary, part academic paper, the comic will attempt to capture something of the multi-layered and visual narrative which informs my illustration work on site – a narrative which I have not satisfactorily captured in any other media. The objective is to create a work which genuinely goes beyond other methods of documenting the archaeological process. The comic will form the core of a poster presentation entitled “Drawn Together” and will be part of a session on Public Archaeology and indigenous culture at next year’s Society for American Archaeology Annual Meeting. Copyright John Swogger. Click image for larger version. Despite a bibliography spanning almost ten years, comics and archaeology is very much still an emerging genre. The medium has much to offer both the discipline’s internal professional and academic discourse and its external, public presentation. As with medicine, journalism and biography, there is great potential in the use of comics in archaeology, and great potential in creating an entirely new kind of archaeological publication. Just as the use of comics in medicine has transcended simple illustrated patient narratives or informational graphics to create an entirely new kind of work – “graphic medicine”, so archaeology too should aspire to the same result. What the genre needs now are archaeologists who recognise the potential offered by comics, and who can translate that potential into new comic works – works which are not just comics about archaeology, but which are a new kind of archaeological publication. Brockbank, A. and Haggarty, B., (2010) Mezolith, David Fickling Books. DeBoer, T., (2004) Shovelbum: Comix of archaeological field life, Alta Mira Press. Furlong, M. and Maleev, A., (2010) ‘The Killing of the Iceman’, National Geographic (November 2010), The National Geographic Society. Gallay, A. and Huout, A., (1992) Le Soleil des Morts, Lombard Press. Gotfredsen, Nuka (2011), De Første Skridt, Grønlands Skolebogsforlag. Goscinny, R. and Uderzo, A., (1969) Asterix the Gaul, (Translation: Bell, A., Hockridge, D.) Brockhampton Press. Lovata, T., (2000) An Exploration of Archaeological Representation: People and the domestic dog on the Great Plains of North America, University of Austin, Texas. Lovata, T., (2005) ‘Talking Dog Archaeology’, The Archaeological Record 5(5), pp. 22-26, Society for American Archaeology. Shanower, E., (2001) Age of Bronze, Image Comics. Swogger, J.G. with Atalay, S. and Tung, B., (2005) Nedir Çatalhöyük?, Çatalhöyük Research Project. 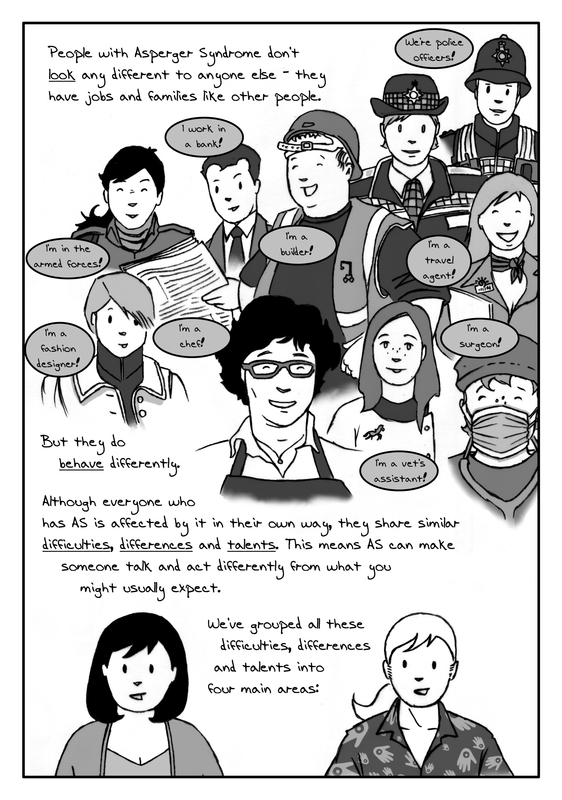 John Swogger is an archaeological illustrator and co-author of the comic book “Something Different About Dad”, about living with a parent with Asperger Syndrome. He is currently writing a comic book memoir about his experiences working as an archaeologist on stone age sites in Turkey. Something Different About Dad copyright John Swogger. Click image for larger version. Pingback: The Sequential Art of the Past: Archaeology, comics and the dynamics of an emerging genre | Tommy found a real book.